In Obit, Daughters Let Dad Have Last Say About NFL's Woeful Chiefs : The Two-Way Loren G. "Sam" Lickteig loved the Chiefs, his family says, but was distraught about how bad the team has been. He was also a funny man. So in his honor, Lickteig's daughters wrote in his obituary that he died "of complications from MS and heartbreaking disappointment" caused by the football team. There were a lot of empty seats at Sunday's Kansas City Chiefs game (which the team lost, to Cincinnati, 28-6). 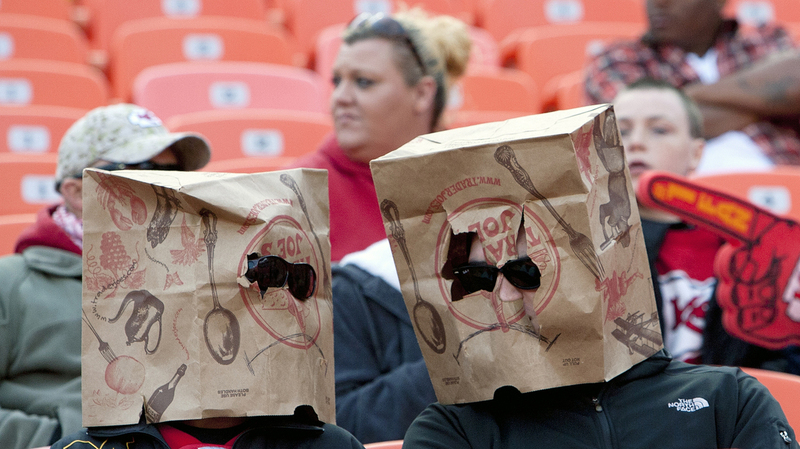 And some fans showed their unhappiness by wearing bags over their heads. "Sam" Lickteig wasn't happy with the Chiefs' play either, his family says. "My dad was such a comedian," Jennifer Lickteig tells Kansas City's KSHB-TV. "He loved the Chiefs, so we had to let him have the last word." The 1-9 Chiefs, tied with the Jacksonville Jaguars for the worst record this season in the National Football League, continue their death march (hey, it sounds like Lickteig would agree!) on Sunday against the Denver Broncos. Chiefs players, by the way, are well aware that the team's fans aren't pleased. Loyal Two-Way readers know that we do enjoy humorous obituaries: Son's Funny And Loving Obituary About Dad Charms Readers.